This surgical atlas is an attempt to describe all the points that I feel are necessary in the selection and preparation of patients for each of the operations covered. In addition, I have included the details of my surgical technique. Through the years, when I have analyzed unsatisfactory results or complications that developed after my surgery, or others’ operations, I have observed that the failure to attend to one tiny detail caused the problem. Therefore, whenever there was an unsatisfactory result or a complication, I tried to go back over what warning sign or change in surgical technique could be utilized to avoid repetition of the problem. Thus, this book is an attempt to share all these details that I feel are important in obtaining good results for patients. To accomplish this, I have tried with text and drawings to describe all the twists and turns that can help make an operation easier and safer while attaining a good result. I have tried to systematize and impart all the information a seasoned surgeon usually only shares verbally in the operating room with residents and colleagues. In order to do this, my medical illustrator, Christine Gralapp, came to the operating room with a photographer equipped with a 35-mm camera with a 200-mm lens. The photographer took approximately 125 to 150 color pictures of the surgical field from about 3 to 4 feet away so that it filled the whole picture. The photographer carefully lined up each shot from my point of view at each step in the operation. 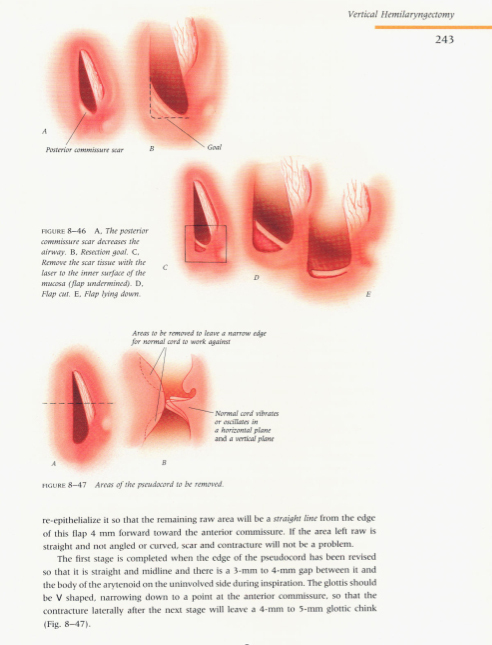 This made it possible for the photographs and, subsequently, the color drawings, to portray the surgical perspective beside or at the top of the operating table rather than the usual anatomic perspective with the larynx represented vertically on the page. This per- spective will encourage the surgeons who use this book to imprint the images of these surgical fields directly in their minds without having to transpose them 45 to 90 degrees, as is commonly the case. Color, much less black-and-white, photographs of soft tissue operative fields do not publish well because of factors such as blood staining of tissues. Black-and-white line drawings do not provide the visual information that color drawings do. Therefore the publisher, Brian Decker, agreed to underwrite the enormous cost of creating as many drawings as I wished to illustrate each operation. First, it was decided which points in the text would benefit from an illustration. Then each illustration was executed by Chris in pencil and revised until it looked as “real” as possible. When I approved the pencil sketch, it was painted in full natural color, not stylized color, so that the arteries are ivory, not red, and the nerves are white, not yellow. I never ceased to be amazed at the extra information that became apparent in the color versions, often necessitating the correction of details that I had missed in spite of careful, repeated examinations of the black-and-white pencil sketches. As originally conceived, this atlas was to describe the soft tissue laryngeal and tracheal, and microdirect laryngoscopy, operations that I have personally done. Brian Decker wished to have a single author describe only those operations that gave consistent results. The reception of this soft tissue atlas will determine whether the second volume, on microlaryngeal laser surgery, is attempted. We would like to acknowledge a number of people. Maxine Calnon typed and retyped the manuscript. Winifred Wong and Sandra Wong, in my office, handled all of the patient scheduling. Brita Saltvol, the operating room otolaryngology head nurse, provided the instrument lists and sources for instruments and supplies. After four years of effort and a liberal expenditure for the color drawings, Brian Decker provided an editorial assistant here, Elizabeth Zima. At B.C. Decker, the project was handled by Dana Dreibelbis and Gina Scala. We are grateful to Dr. Charles Cummings for carefully reading the manuscript and offering several good suggestions, most of which were adopted. 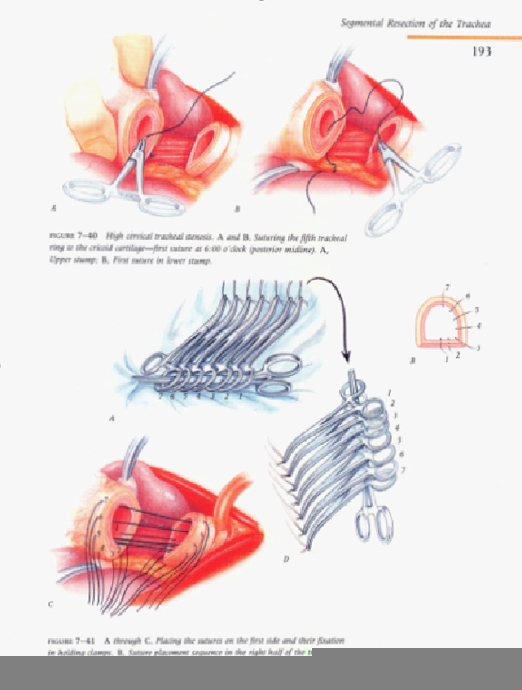 If some surgeons find any point in this atlas useful, appreciation is due Dr. Roger Boles, formes Chairman of Otolaryngology, and Miss Ruth Wakerlin, former Director of Medical Illustration, at the University of California at San Francisco; and Mr. Decker for encouraging me to write it. I would also like to thank my friends Mr. and Mrs. Edward McBride of Fort Myers, Florida, and MI. and Mrs. Paul Putman of Toledo, Ohio, for their generous donations to our San Francisco Foundation of Otology and Laryngology that have been so helpful in completing this and many other projects. I especially appreciate the care provided my patients by my residents and nurses, and the support of my family during this lengthy project. HERBERT H. DEDO, M.D. The diagnosis of posterior glottic stenosis has been missed in some patients because direct laryngoscopy has not been routinely done in patients with apparent bilateral recurrent laryngeal nerve paralysis after endotracheal tube intubation.’ It is important to recognize posterior commissure stenosis when it is present because it can now be treated successfully, often endoscopically, with KTP532 laser* submucosal scar resection, creation of micro-trapdoor mucosal flaps andlor Teflon keels.’.’ If necessary, laryngofissure with mucosal flap advancement can be done (see Chapter 6, Laryngofissure) so that the tracheotomy tube can be removed. 1. Risks and alternatives are explained to the patient and documented in the chart. 2. Operative permit is signed. 3. Blood is typed and cross-matched if it is anticipated that the patient will lose more than 1 unit of blood during the operation. 4. Laboratory data are checked to make sure they are within normal limits. 5. Physical examination is in chart. 6. Nasogastric tube is installed (if it will be needed after the operation). 8. Review of the surgical instruments with the circulating nurse. tape for laser surgery), oral, nasal, or via tracheotomy, with the anesthesiologist. 10. Give IV antibiotics during all operations in which the pharyngeal mucosa is open, which will cause saliva contamination of the neck and trachea. 11. Position the patient properly on the operating room table, with the top of the patient’s head flush with the head end of the operating room table. 12. Adjust the surgical lights over the surgical field after the patient is asleep so that the light will not be in his or her eyes before anesthetization. Do this before scrubbing. 13. Check the Bovie electrocautery to see that it is plugged in and working. 14. Check the suction trap, bottle, and hose to see whether all are functioning properly. 15. Place IV poles at the corners of the head of the table if the anesthesiologist is to be situated at the patient’s head. In all operations with a tracheotomy (except free-standing tracheotomy), the anesthesiologist is at the left hip of the patient, and the IV poles should be placed 18 inches from the left shoulder and adjacent to the left ankle. 16. Confirm with the nurse or surgical assistant the skin area to be shaved and sterilized.